1958 Studebaker President 4 Door Photo Picture Classic Cars for sale & Classifieds - Buy Sell Classic Car & Classic Truck Classifieds. 1958 Studebaker President 4 Door, with a 289 V-8 in it! 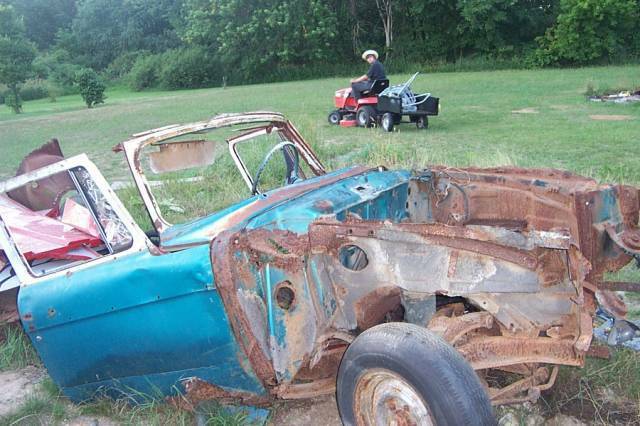 I think its restorab----wheres the back of the car? Hey, look. Bigfoot is standing by that tree back there. The guy on the lawnmower did it!! Running when parked! Tee hee! just a little bondo needed!!!! !seller motivated! "MINOR" Fender Damage? LOL The Fenders Ain't Damaged They're GONE! oh whos the person on the lawn mower? theres still some good parts left on it though! that was a nice blue paint before it rusted away! Steering wheel might still be ok.
awww shucks.. It's not that bad... just slight surface rust and minor fender damage..... Yeah, that's right. It's a keeper!